"Trophy Box Cards and Live Box Breaks (LBB) are pleased to announce their partnership. Trophy Box Cards developed a platform where users can draft and trade cards while interacting with other customers, all in a live, interactive application. Live Box Breaks is a well-respected group breaker who is looking to add some excitement to their box and case breaks while offering multiple new types of breaks using Trophy Box’s technology. The exclusive licensing agreement will allow Live Box Breaks to expand their brand and reach new customers. Users will be able to sign onto the Live Box Breaks website and buy into drafts. Once the drafts begin, the order is randomly assigned for a snake draft of all available cards or teams. Live Box Breaks has already held some preliminary drafts and customers are excited for their new site to go fully live." 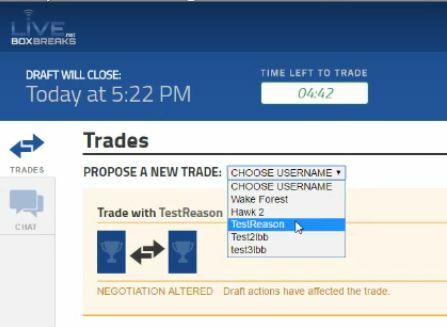 One unique aspect of this technology that will help distinguish LBB from more standard breakers is it allows people to draft their own team(s), player(s), or card(s), similar to the way a draft works in fantasy sports. Instead of relying solely on a randomizer to determine which participant gets which spot in a break, collectors will be able to strategize and actively participate in the process. They will then have a timed and controlled arena, all within the software, to be able to chat and trade before it is finished. Leading up to the 2016 National in Atlantic City, LBB will be holding drafts during their normal breaking hours, starting at 9pm EST. During The National, LBB will host a full schedule of breaks and drafts along with over $5,000 worth of giveaways, including free drafts, cases, packs, and more. I think this brand new system will make fresh wave in this industry.